Mrs. Richards: I've booked a room with a bath and a sea view for three nights. I specifically asked for a sea view in my written confirmation, so please make sure I have it. Mrs. Richards: KC? KC? What are you trying to say? Manuel: No, no no no. Qué, "what." Mrs. Richards: Who is this C.K. Watt? Mrs. Richards: Is he the manager? Mrs. Richards: Oh, what are you talking about, you silly little man? Mrs. Richards: Girl, I start to ask this man about my room, and he tells me the manager is a Mr. Watt, aged forty. Manuel: No, no no. "Fawwl-ty." Mrs. Richards: Faulty? What's wrong with him? Basil Fawlty: May I help you, madam? Mrs. Richards: Are you the manager? Basil Fawlty: I am the *owner*. Basil Fawlty: I am the owner. Mrs. Richards: I want to speak to the manager. Basil Fawlty: [impatiently] I am the manager, too. Basil Fawlty: I am the manager *as well*. Manuel: [confirming Basil's identity] Manager, him manager. Mrs. Richards: Oh. You're Watt. Basil Fawlty: [confused] I'm the manager. Basil Fawlty: I'm the manager. Mrs. Richards: Yes, I know, you've just told me; what's the matter with you? Now listen to me. I specifically requested a bath for my room. When I pay for a bath, I expect to get a bath. Basil Fawlty: You've *got* a bath. Mrs. Richards: I'm not paying seventeen-pounds-fifty per night plus VAT for a room without a bath. Basil Fawlty: [indicating private bath in adjoining room] There is your bath. Mrs. Richards: You call that a bath? It's not big enough to drown a mouse. It's disgraceful. Basil Fawlty: [sotto voice] I wish you were a mouse; I'd show you. Mrs. Richards: [standing next to the window] And another thing: I asked for aroom with a view. 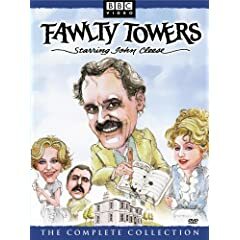 Basil Fawlty: [aside to Manuel] Deaf, mad, *and* blind. Basil Fawlty: This is the view as far as I can remember... Yes... Yes, this is it. Mrs. Richards: When I pay for a view, I expect to see something more interesting than that. Basil Fawlty: That is Torquay, madam. Mrs. Richards: Well, that's not good enough. Mrs. Richards: Don't be ridiculous. I expect to be able to see the sea. Basil Fawlty: You *can* see the sea. It's over there between the land and the sky. Mrs. Richards: I'd need a telescope to see that. Basil Fawlty: Well, might I suggest you move to a hotel closer to the sea. Basil Fawlty: Or preferably in it. Mrs. Richards: Now listen to me. I'm not satisfied, but I've decided to stay here. However, I shall expect a reduction. Mrs. Richards: No. Because the room is cold, the bath is too small, the view is invisible, and the radio doesn't work. Basil Fawlty: No, the radio works. Basil Fawlty: But I can fix it, you see. Basil Fawlty: You scabby old bat. Basil Fawlty: [shutting it off] I think we got something then. Basil Fawlty: [louder] I think we got something then. Mrs. Richards: What are you doing? Manuel: [still with hands tightly over ears] QUÉ?